Halloween abounds with images of the dark and dreary and the gross and slimy so it's always refreshing to come across a pleasant image associated with the holiday, like this happy card from A Little Hut! 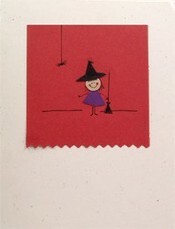 Featuring a good little witch, this inviting card would make for a great Halloween hello or party invitation (just remind guests that they have to bring their own broom!) Made from recycled paper, it features a design hand-cut from colorful archival paper with hand-drawn details, nuanced by the lovely Patricia Zapata. A multi-tasking maven, Patricia is also the brains behind the blog, Crafty Synergy where she frequently features detailed interviews of her fellow indie business women. Take a look at the blog for tons of inspiration from crafty ladies, and check out this craft lady's site, A Little Hut!